Michiana Paint doesn’t just paint we do drywall repair to! Nothing ruins your day like a big hole in your finely finished wall. Maybe the kids tripped and bumped into the wall, maybe the dog ran too fast and skidded to a stop leaving a huge indentation in your pretty wall. So what should you do? Call us at Michiana Paint! We can repair holes, big or small. When we’re done you will never even know an accident ever happened. We at Michiana Paint know having someone come into your home can be hassle. Maybe you have to take off work or have someone watch the kids, that’s why we strive to be in and out in a minimal time, but that doesn’t mean we skimp or rush the job. We strive to make sure the job is done right and to your liking. Our number one compliment is that you never knew we were there. 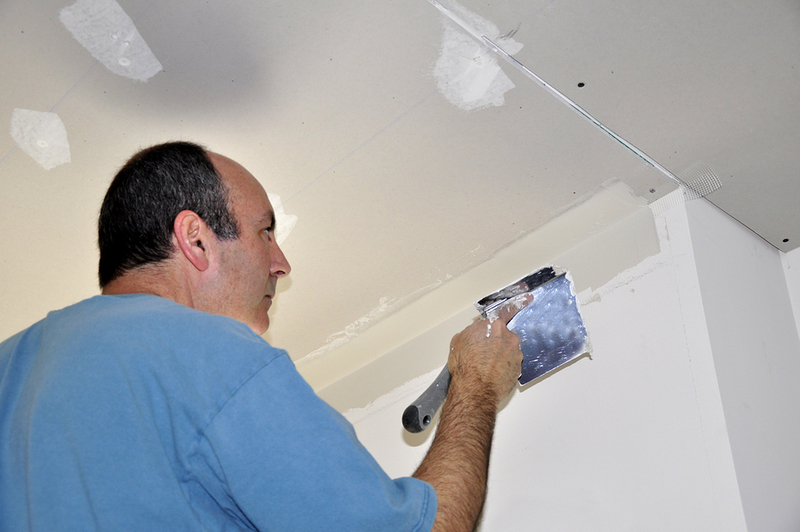 All of our drywall repair is done seamlessly and to a clean invisible finish. We make sure no tape lines are shown, no screws can be seen and all dust is removed before paint. That way the finished product can shine. We at Michiana Paint can repair drywall from water damage also. You may not have holes or cracks but water can discolor drywall and make for an unsightly mess. Also water damage can create mold in places you may not see. We can come in and check all around the area to make sure that when we are done you won’t have any other problems in the future. Water damage can stem from leaky pipes, leaky windows, moisture from showers and even the remains from fire damage, where water or other chemicals were used to put out the fire. We will come in and assess the damage and figure out what the best course of action is to replace your water damaged dry wall. It may not be necessary to replace a whole sheet, it might be better to just replace a small portion of the wall, which can save you time and money. We’ve seen all types of drywall problems. Some are accidents; some are just caused by age. We here at Michiana Paint can repair them all. Sometimes you’ve added onto a room or installed a window and you need someone to come in and fix the small things that come up. Maybe it’s an errant hammer blow or a ladder falling into the work area, we at Michiana Paint can and have fixed them all. We don’t rush our work. Nothing looks worse than a sloppy drywall job. Drywall isn’t hard but only professionals like ourselves can make it look easy. When you need to make that perfect cut around that outlet or trying keep everything vertical and true it takes a certain skill that we at Michiana Paint have. So no matter what the problem you have with your drywall, we at Michiana Paint can do the job, smoothly and for a reasonable price.